ELKHART, Ind. – It’s something no one wants to come across: a six-inch spider. An employee at Godfrey Marine encountered the gigantic arachnid while building a boat at work. Jacob Collins, who shared photos of the spider on Facebook, didn’t know what to think at first. 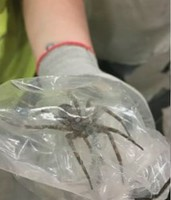 He later found out it was a fishing spider – something the Indiana Department of Natural Resources said is relatively harmless despite its terrifying appearance. The spider’s three-inch legs allows it to walk on water. It’s often mistaken for a wolf spider, one of the most common large spiders found in Indiana. Collins and his co-workers caught the fishing spider and snapped a few photos of the impressive specimen. Then they returned it to the wild. Source: WHNT, June 7, 2018. I've never heard of a fishing spider. I am happy that they did not kill it, but instead returned it to the wild. I hope I never come across something like that. I don't like spiders. Why the hell are you happy they didn't kill the damned thing? It doesn't look like a fishing spider to me; they usually have a leg-span of no more than 3 inches, not 6 friggin' inches! It looks to me like a Brazilian wandering spider, which is deadly poisonous and their bite is even worse on men than women. Spiders are like dogs because the only good spider is a dead spider. I don't believe in killing anything if it can be avoided. I'm no expert on spiders, but I do know that most spiders (maybe all) get a bad rap without much reason. All spiders are venomous, but most spiders cannot inject a human with enough venom to actually kill them, or even seriously harm them, unless the person has an allergy to them. As creepy and scary as they are, most would rather avoid biting a human at all costs. Most bites happen because someone touches the spider by mistake. So if a mosquito alights on you and is sucking your blood, you don't swat it? If that thing is a Brazilian wandering spider, they are extremely aggressive and will actually attack if you bother them. I saw a PBS show about spiders and if you try to kill a Brazilian wandering spider with a broom or something, they will actually run up the broom handle and jump on you. So why is their bite worse on men than women? If a mosquito is biting me, I do try not to kill it. I have killed bugs that have landed on me on accident, or I swat them out of automatic reaction. But I do try not to do that. When they bite men, the man gets a very painful erection that lasts for hours and sometimes it swells so much that the skin breaks and if he survives, the man is often left impotent. What's wrong with you? Mosquitoes carry all kinds of fevers as well as the West Nile and Zika viruses. You really need to get over all these silly notions about killing insects, arachnids and other things. What are you going to do if you ever get termites or roaches? What I do is I tray to take measures to avoid having to kill them. Like for mosquitoes, if I know I am going to be outside where I could encounter them, I wear repellent. I do know they carry disease. It's not like I just let them bite me. We have a bi-monthly pest service come and spray and leave bait around our house so as to avoid pest infestations. This does mean killing some, but it saves having to kill millions at a time. It's not that I expect to not have to kill anything. I truly don't think that it is possible to live without killing some. I just try and limit it as much as possible. I believe that every living being has a right to its life, and unless I can't, I let them live. When I find a spider or bug in my house, no matter how horrific they are, I catch and release it.